YUSUFALI: The revelation of this Book is from Allah, the Exalted in Power, full of Wisdom. YUSUFALI: Verily it is We Who have revealed the Book to thee in Truth: so serve Allah, offering Him sincere devotion. PICKTHAL: Lo! We have revealed the Scripture unto thee (Muhammad) with truth; so worship Allah, making religion pure for Him (only). SHAKIR: Surely We have revealed to you the Book with the truth, therefore serve Allah, being sincere to Him in obedience. YUSUFALI: Is it not to Allah that sincere devotion is due? But those who take for protectors other than Allah (say): "We only serve them in order that they may bring us nearer to Allah." Truly Allah will judge between them in that wherein they differ. But Allah guides not such as are false and ungrateful. PICKTHAL: Surely pure religion is for Allah only. And those who choose protecting friends beside Him (say): We worship them only that they may bring us near unto Allah. Lo! Allah will judge between them concerning that wherein they differ. Lo! Allah guideth not him who is a liar, an ingrate. SHAKIR: Now, surely, sincere obedience is due to Allah (alone) and (as for) those who take guardians besides Him, (saying), We do not serve them save that they may make us nearer to Allah, surely Allah will judge between them in that in which they differ; surely Allah does not guide him aright who is a liar, ungrateful. YUSUFALI: He created the heavens and the earth in true (proportions): He makes the Night overlap the Day, and the Day overlap the Night: He has subjected the sun and the moon (to His law): Each one follows a course for a time appointed. Is not He the Exalted in Power - He Who forgives again and again? PICKTHAL: He hath created the heavens and the earth with truth. He maketh night to succeed day, and He maketh day to succeed night, and He constraineth the sun and the moon to give service, each running on for an appointed term. Is not He the Mighty, the Forgiver? YUSUFALI: He created you (all) from a single person: then created, of like nature, his mate; and he sent down for you eight head of cattle in pairs: He makes you, in the wombs of your mothers, in stages, one after another, in three veils of darkness. such is Allah, your Lord and Cherisher: to Him belongs (all) dominion. There is no god but He: then how are ye turned away (from your true Centre)? PICKTHAL: He created you from one being, then from that (being) He made its mate; and He hath provided for you of cattle eight kinds. He created you in the wombs of your mothers, creation after creation, in a threefold gloom. Such is Allah, your Lord. His is the Sovereignty. There is no Allah save Him. How then are ye turned away? SHAKIR: He has created you from a single being, then made its mate of the same (kind), and He has made for you eight of the cattle in pairs. He creates you in the wombs of your mothers-- a creation after a creation-- in triple darkness; that is Allah your Lord, His is the kingdom; there is no god but He; whence are you then turned away? YUSUFALI: If ye reject (Allah), Truly Allah hath no need of you; but He liketh not ingratitude from His servants: if ye are grateful, He is pleased with you. No bearer of burdens can bear the burden of another. In the end, to your Lord is your Return, when He will tell you the truth of all that ye did (in this life). for He knoweth well all that is in (men's) hearts. PICKTHAL: If ye are thankless, yet Allah is Independent of you, though He is not pleased with thanklessness for His bondmen; and if ye are thankful He is pleased therewith for you. No laden soul will bear another's load. Then unto your Lord is your return; and He will tell you what ye used to do. Lo! He knoweth what is in the breasts (of men). SHAKIR: If you are ungrateful, then surely Allah is Self-sufficient above all need of you; and He does not like ungratefulness in His servants; and if you are grateful, He likes it in you; and no bearer of burden shall bear the burden of another; then to your Lord is your return, then will He inform you of what you did; surely He is Cognizant of what is in the breasts. YUSUFALI: When some trouble toucheth man, he crieth unto his Lord, turning to Him in repentance: but when He bestoweth a favour upon him as from Himself, (man) doth forget what he cried and prayed for before, and he doth set up rivals unto Allah, thus misleading others from Allah's Path. Say, "Enjoy thy blasphemy for a little while: verily thou art (one) of the Companions of the Fire!" PICKTHAL: And when some hurt toucheth man, he crieth unto his Lord, turning unto Him (repentant). Then, when He granteth him a boon from Him he forgetteth that for which he cried unto Him before, and setteth up rivals to Allah that he may beguile (men) from his way. Say (O Muhammad, unto such an one): Take pleasure in thy disbelief a while. Lo! thou art of the owners of the Fire. SHAKIR: And when distress afflicts a man he calls upon his Lord turning to Him frequently; then when He makes him possess a favor from Him, he forgets that for which he called upon Him before, and sets up rivals to Allah that he may cause (men) to stray off from His path. Say: Enjoy yourself in your ungratefulness a little, surely you are of the inmates of the fire. YUSUFALI: Say: "O ye my servants who believe! Fear your Lord, good is (the reward) for those who do good in this world. Spacious is Allah's earth! those who patiently persevere will truly receive a reward without measure!" PICKTHAL: Say: O My bondmen who believe! Observe your duty to your Lord. For those who do good in this world there is good, and Allah's earth is spacious. Verily the steadfast will be paid their wages without stint. SHAKIR: Say: O my servants who believe! be careful of (your duty to) your Lord; for those who do good in this world is good, and Allah's earth is spacious; only the patient will be paid back their reward in full without measure. PICKTHAL: Say (O Muhammad): Lo! I am commanded to worship Allah, making religion pure for Him (only). SHAKIR: Say: I am commanded that I should serve Allah, being sincere to Him in obedience. YUSUFALI: "And I am commanded to be the first of those who bow to Allah in Islam." PICKTHAL: And I am commanded to be the first of those who are muslims (surrender unto Him). SHAKIR: And I am commanded that I shall be the first of those who submit. YUSUFALI: Say: "I would, if I disobeyed my Lord, indeed have fear of the Penalty of a Mighty Day." PICKTHAL: Say: Lo! if I should disobey my Lord, I fear the doom of a tremendous Day. SHAKIR: Say: I fear, if I disobey my Lord, the chastisement of a grievous day. PICKTHAL: Say: Allah I worship, making my religion pure for Him (only). YUSUFALI: "Serve ye what ye will besides him." Say: "Truly, those in loss are those who lose their own souls and their People on the Day of Judgment: Ah! that is indeed the (real and) evident Loss! PICKTHAL: Then worship what ye will beside Him. Say: The losers will be those who lose themselves and their housefolk on the Day of Resurrection. Ah, that will be the manifest loss! SHAKIR: Serve then what you like besides Him. Say: The losers surely are those who shall have lost themselves and their families on the day of resurrection; now surely that is the clear loss. YUSUFALI: They shall have Layers of Fire above them, and Layers (of Fire) below them: with this doth Allah warn off his servants: "O My Servants! then fear ye Me!" PICKTHAL: They have an awning of fire above them and beneath them a dais (of fire). With this doth Allah appal His bondmen. O My bondmen, therefor fear Me! SHAKIR: They shall have coverings of fire above them and coverings beneath them; with that Allah makes His servants to fear, so be careful of (your duty to) Me, O My servants! YUSUFALI: Those who listen to the Word, and follow the best (meaning) in it: those are the ones whom Allah has guided, and those are the ones endued with understanding. PICKTHAL: Who hear advice and follow the best thereof. Such are those whom Allah guideth, and such are men of understanding. SHAKIR: Those who listen to the word, then follow the best of it; those are they whom Allah has guided, and those it is who are the men of understanding. YUSUFALI: Is, then, one against whom the decree of Punishment is justly due (equal to one who eschews Evil)? Wouldst thou, then, deliver one (who is) in the Fire? PICKTHAL: Is he on whom the word of doom is fulfilled (to be helped), and canst thou (O Muhammad) rescue him who is in the Fire? SHAKIR: What! as for him then against whom the sentence of chastisement is due: What! can you save him who is in the fire? YUSUFALI: But it is for those who fear their Lord. That lofty mansions, one above another, have been built: beneath them flow rivers (of delight): (such is) the Promise of Allah: never doth Allah fail in (His) promise. PICKTHAL: But those who keep their duty to their Lord, for them are lofty halls with lofty halls above them, built (for them), beneath which rivers flow. (It is) a promise of Allah. Allah faileth not His promise. SHAKIR: But (as for) those who are careful of (their duty to) their Lord, they shall have high places, above them higher places, built (for them), beneath which flow rivers; (this is) the promise of Allah: Allah will not fail in (His) promise. YUSUFALI: Seest thou not that Allah sends down rain from the sky, and leads it through springs in the earth? Then He causes to grow, therewith, produce of various colours: then it withers; thou wilt see it grow yellow; then He makes it dry up and crumble away. Truly, in this, is a Message of remembrance to men of understanding. PICKTHAL: Hast thou not seen how Allah hath sent down water from the sky and hath caused it to penetrate the earth as watersprings, and afterward thereby produceth crops of divers hues; and afterward they wither and thou seest them turn yellow; then He maketh them chaff. Lo! herein verily is a reminder for men of understanding. YUSUFALI: Is one whose heart Allah has opened to Islam, so that he has received Enlightenment from Allah, (no better than one hard-hearted)? Woe to those whose hearts are hardened against celebrating the praises of Allah! they are manifestly wandering (in error)! PICKTHAL: Is he whose bosom Allah hath expanded for Al-Islam, so that he followeth a light from his Lord, (as he who disbelieveth)? Then woe unto those whose hearts are hardened against remembrance of Allah. Such are in plain error. SHAKIR: What! is he whose heart Allah has opened for Islam so that he is in a light from his Lord (like the hard-hearted)? Nay, woe to those whose hearts are hard against the remembrance of Allah; those are in clear error. YUSUFALI: Allah has revealed (from time to time) the most beautiful Message in the form of a Book, consistent with itself, (yet) repeating (its teaching in various aspects): the skins of those who fear their Lord tremble thereat; then their skins and their hearts do soften to the celebration of Allah's praises. Such is the guidance of Allah: He guides therewith whom He pleases, but such as Allah leaves to stray, can have none to guide. PICKTHAL: Allah hath (now) revealed the fairest of statements, a Scripture consistent, (wherein promises of reward are) paired (with threats of punishment), whereat doth creep the flesh of those who fear their Lord, so that their flesh and their hearts soften to Allah's reminder. Such is Allah's guidance, wherewith He guideth whom He will. And him whom Allah sendeth astray, for him there is no guide. SHAKIR: Allah has revealed the best announcement, a book conformable in its various parts, repeating, whereat do shudder the skins of those who fear their Lord, then their skins and their hearts become pliant to the remembrance of Allah; this is Allah's guidance, He guides with it whom He pleases; and (as for) him whom Allah makes err, there is no guide for him. YUSUFALI: Is, then, one who has to fear the brunt of the Penalty on the Day of Judgment (and receive it) on his face, (like one guarded therefrom)? It will be said to the wrong-doers: "Taste ye (the fruits of) what ye earned!" PICKTHAL: Is he then, who will strike his face against the awful doom upon the Day of Resurrection (as he who doeth right)? And it will be said unto the wrong-doers: Taste what ye used to earn. SHAKIR: Is he then who has to guard himself with his own person against the evil chastisement on the resurrection day? And it will be said to the unjust: Taste what you earned. YUSUFALI: Those before them (also) rejected (revelation), and so the Punishment came to them from directions they did not perceive. PICKTHAL: Those before them denied, and so the doom came on them whence they knew not. SHAKIR: Those before them rejected (prophets), therefore there came to them the chastisement from whence they perceived not. YUSUFALI: So Allah gave them a taste of humiliation in the present life, but greater is the punishment of the Hereafter, if they only knew! PICKTHAL: Thus Allah made them taste humiliation in the life of the world, and verily the doom of the Hereafter will be greater if they did but know. SHAKIR: So Allah made them taste the disgrace in this world's life, and certainly the punishment of the hereafter is greater; did they but know! YUSUFALI: We have put forth for men, in this Qur'an every kind of Parable, in order that they may receive admonition. SHAKIR: And certainly We have set forth to men in this Quran similitudes of every sort that they may mind. 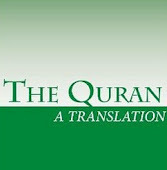 YUSUFALI: (It is) a Qur'an in Arabic, without any crookedness (therein): in order that they may guard against Evil. PICKTHAL: A Lecture in Arabic, containing no crookedness, that haply they may ward off (evil). SHAKIR: An Arabic Quran without any crookedness, that they may guard (against evil). YUSUFALI: Allah puts forth a Parable a man belonging to many partners at variance with each other, and a man belonging entirely to one master: are those two equal in comparison? Praise be to Allah! but most of them have no knowledge. PICKTHAL: Allah coineth a similitude: A man in relation to whom are several part-owners, quarrelling, and a man belonging wholly to one man. Are the two equal in similitude? Praise be to Allah! But most of them know not. SHAKIR: Allah sets forth an example: There is a slave in whom are (several) partners differing with one another, and there is another slave wholly owned by one man. Are the two alike in condition? (All) praise is due to Allah. Nay! most of them do not know. YUSUFALI: Truly thou wilt die (one day), and truly they (too) will die (one day). SHAKIR: Surely you shall die and they (too) shall surely die. YUSUFALI: In the end will ye (all), on the Day of Judgment, settle your disputes in the presence of your Lord. PICKTHAL: Then lo! on the Day of Resurrection, before your Lord ye will dispute. SHAKIR: Then surely on the day of resurrection you will contend one with another before. your Lord. YUSUFALI: Who, then, doth more wrong than one who utters a lie concerning Allah, and rejects the Truth when it comes to him; is there not in Hell an abode for blasphemers? PICKTHAL: And who doth greater wrong than he who telleth a lie against Allah, and denieth the truth when it reacheth him? Will not the home of disbelievers be in hell? SHAKIR: Who is then more unjust than he who utters a lie against Allah and (he who) gives the lie to the truth when it comes to him; is there not in hell an abode for the unbelievers? YUSUFALI: And he who brings the Truth and he who confirms (and supports) it - such are the men who do right. PICKTHAL: And whoso bringeth the truth and believeth therein - Such are the dutiful. SHAKIR: And he who brings the truth and (he who) accepts it as the truth-- these are they that guard (against evil). YUSUFALI: So that Allah will turn off from them (even) the worst in their deeds and give them their reward according to the best of what they have done. PICKTHAL: That Allah will remit from them the worst of what they did, and will pay them for reward the best they used to do. SHAKIR: So that Allah will do away with the worst of what they did and give them their reward for the best of what they do. YUSUFALI: And such as Allah doth guide there can be none to lead astray. Is not Allah Exalted in Power, (Able to enforce His Will), Lord of Retribution? PICKTHAL: And he whom Allah guideth, for him there can be no misleader. Is not Allah Mighty, Able to Requite (the wrong)? SHAKIR: And whom Allah guides, there is none that can lead him astray; is not Allah Mighty, the Lord of retribution? YUSUFALI: If indeed thou ask them who it is that created the heavens and the earth, they would be sure to say, "Allah". Say: "See ye then? the things that ye invoke besides Allah,- can they, if Allah wills some Penalty for me, remove His Penalty?- Or if He wills some Grace for me, can they keep back his Grace?" Say: "Sufficient is Allah for me! In Him trust those who put their trust." PICKTHAL: And verily, if thou shouldst ask them: Who created the heavens and the earth? they will say: Allah. Say: Bethink you then of those ye worship beside Allah, if Allah willed some hurt for me, could they remove from me His hurt; or if He willed some mercy for me, could they restrain His mercy? Say: Allah is my all. In Him do (all) the trusting put their trust. SHAKIR: And should you ask them, Who created the heavens and the earth? They would most certainly say: Allah. Say: Have you then considered that what you call upon besides Allah, would they, if Allah desire to afflict me with harm, be the removers of His harm, or (would they), if Allah desire to show me mercy, be the withholders of His mercy? Say: Allah is sufficient for me; on Him do the reliant rely. SHAKIR: Say: O my people! work in your place, surely I am a worker, so you will come to know. YUSUFALI: "Who it is to whom comes a Penalty of ignominy, and on whom descends a Penalty that abides." PICKTHAL: Who it is unto whom cometh a doom that will abase him, and on whom there falleth everlasting doom. SHAKIR: Who it is to whom there shall come a punishment which will disgrace him and to whom will be due a lasting punishment. YUSUFALI: Verily We have revealed the Book to thee in Truth, for (instructing) mankind. He, then, that receives guidance benefits his own soul: but he that strays injures his own soul. Nor art thou set over them to dispose of their affairs. PICKTHAL: Lo! We have revealed unto thee (Muhammad) the Scripture for mankind with truth. Then whosoever goeth right it is for his soul, and whosoever strayeth, strayeth only to its hurt. And thou art not a warder over them. YUSUFALI: It is Allah that takes the souls (of men) at death; and those that die not (He takes) during their sleep: those on whom He has passed the decree of death, He keeps back (from returning to life), but the rest He sends (to their bodies) for a term appointed verily in this are Signs for those who reflect. PICKTHAL: Allah receiveth (men's) souls at the time of their death, and that (soul) which dieth not (yet) in its sleep. He keepeth that (soul) for which He hath ordained death and dismisseth the rest till an appointed term. Lo! herein verily are portents for people who take thought. SHAKIR: Allah takes the souls at the time of their death, and those that die not during their sleep; then He withholds those on whom He has passed the decree of death and sends the others back till an appointed term; most surely there are signs in this for a people who reflect. YUSUFALI: What! Do they take for intercessors others besides Allah? Say: "Even if they have no power whatever and no intelligence?" PICKTHAL: Or choose they intercessors other than Allah? Say: What! Even though they have power over nothing and have no intelligence? SHAKIR: Or have they taken intercessors besides Allah? Say: what! even though they did not ever have control over anything, nor do they understand. YUSUFALI: Say: "To Allah belongs exclusively (the right to grant) intercession: to Him belongs the dominion of the heavens and the earth: In the End, it is to Him that ye shall be brought back." PICKTHAL: Say: Unto Allah belongeth all intercession. His is the Sovereignty of the heavens and the earth. And afterward unto Him ye will be brought back. SHAKIR: Say: Allah's is the intercession altogether; His is the kingdom of the heavens and the earth, then to Him you shall be brought back. YUSUFALI: When Allah, the One and Only, is mentioned, the hearts of those who believe not in the Hereafter are filled with disgust and horror; but when (gods) other than He are mentioned, behold, they are filled with joy! PICKTHAL: And when Allah alone is mentioned, the hearts of those who believe not in the Hereafter are repelled, and when those (whom they worship) beside Him are mentioned, behold! they are glad. SHAKIR: And when Allah alone is mentioned, the hearts of those who do not believe in the hereafter shrink, and when those besides Him are mentioned, lo! they are joyful. YUSUFALI: Say: "O Allah! Creator of the heavens and the earth! Knower of all that is hidden and open! it is Thou that wilt judge between Thy Servants in those matters about which they have differed." PICKTHAL: Say: O Allah! Creator of the heavens and the earth! Knower of the Invisible and the Visible! Thou wilt judge between Thy slaves concerning that wherein they used to differ. SHAKIR: Say: O Allah! Originator of the heavens and the earth, Knower of the unseen and the seen! Thou (only) judgest between Thy servants as to that wherein they differ. YUSUFALI: Even if the wrong-doers had all that there is on earth, and as much more, (in vain) would they offer it for ransom from the pain of the Penalty on the Day of Judgment: but something will confront them from Allah, which they could never have counted upon! PICKTHAL: And though those who do wrong possess all that is in the earth, and therewith as much again, they verily will seek to ransom themselves therewith on the Day of Resurrection from the awful doom; and there will appear unto them, from their Lord, that wherewith they never reckoned. SHAKIR: And had those who are unjust all that is in the earth and the like of it with it, they would certainly offer it as ransom (to be saved) from the evil of the punishment on the day of resurrection; and what they never thought of shall become plain to them from Allah. YUSUFALI: For the evils of their Deeds will confront them, and they will be (completely) encircled by that which they used to mock at! PICKTHAL: And the evils that they earned will appear unto them, and that whereat they used to scoff will surround them. SHAKIR: And the evil (consequences) of what they wrought shall become plain to them, and the very thing they mocked at shall beset them. YUSUFALI: Now, when trouble touches man, he cries to Us: But when We bestow a favour upon him as from Ourselves, he says, "This has been given to me because of a certain knowledge (I have)!" Nay, but this is but a trial, but most of them understand not! PICKTHAL: Now when hurt toucheth a man he crieth unto Us, and afterward when We have granted him a boon from Us, he saith: Only by force of knowledge I obtained it. Nay, but it is a test. But most of them know not. SHAKIR: So when harm afflicts a man he calls upon Us; then, when We give him a favor from Us, he says: I have been given it only by means of knowledge. Nay, it is a trial, but most of them do not know. YUSUFALI: Thus did the (generations) before them say! But all that they did was of no profit to them. SHAKIR: Those before them did say it indeed, but what they earned availed them not. YUSUFALI: Nay, the evil results of their Deeds overtook them. And the wrong-doers of this (generation)- the evil results of their Deeds will soon overtake them (too), and they will never be able to frustrate (Our Plan)! PICKTHAL: But the evils that they earned smote them; and such of these as do wrong, the evils that they earn will smite them; they cannot escape. SHAKIR: So there befell them the evil (consequences) of what they earned; and (as for) those who are unjust from among these, there shall befall them the evil (consequences) of what they earn, and they shall not escape. YUSUFALI: Know they not that Allah enlarges the provision or restricts it, for any He pleases? Verily, in this are Signs for those who believe! PICKTHAL: Know they not that Allah enlargeth providence for whom He will, and straiteneth it (for whom He will). Lo! herein verily are portents for people who believe. SHAKIR: Do they not know that Allah makes ample the means of subsistence to whom He pleases, and He straitens; most surely there are signs in this for a people who believe. YUSUFALI: Say: "O my Servants who have transgressed against their souls! Despair not of the Mercy of Allah: for Allah forgives all sins: for He is Oft-Forgiving, Most Merciful. PICKTHAL: Say: O My slaves who have been prodigal to their own hurt! Despair not of the mercy of Allah, Who forgiveth all sins. Lo! He is the Forgiving, the Merciful. SHAKIR: Say: O my servants! who have acted extravagantly against their own souls, do not despair of the mercy of Allah; surely Allah forgives the faults altogether; surely He is the Forgiving the Merciful. YUSUFALI: "Turn ye to our Lord (in repentance) and bow to His (Will), before the Penalty comes on you: after that ye shall not be helped. PICKTHAL: Turn unto your Lord repentant, and surrender unto Him, before there come unto you the doom, when ye cannot be helped. SHAKIR: And return to your Lord time after time and submit to Him before there comes to you the punishment, then you shall not be helped. PICKTHAL: Lest any soul should say: Alas, my grief that I was unmindful of Allah, and I was indeed among the scoffers! PICKTHAL: Or should say: If Allah had but guided me I should have been among the dutiful! PICKTHAL: Or should say, when it seeth the doom: Oh, that I had but a second chance that I might be among the righteous! SHAKIR: Or it should say when it sees the punishment: Were there only a returning for me, I should be of the doers of good. YUSUFALI: "(The reply will be:) 'Nay, but there came to thee my Signs, and thou didst reject them: thou wast Haughty, and became one of those who reject faith!'" PICKTHAL: (But now the answer will be): Nay, for My revelations came unto thee, but thou didst deny them and wast scornful and wast among the disbelievers. SHAKIR: Aye! My communications came to you, but you rejected them, and you were proud and you were one of the unbelievers. YUSUFALI: On the Day of Judgment wilt thou see those who told lies against Allah;- their faces will be turned black; Is there not in Hell an abode for the Haughty? PICKTHAL: And on the Day of Resurrection thou (Muhammad) seest those who lied concerning Allah with their faces blackened. Is not the home of the scorners in hell? SHAKIR: And on the day of resurrection you shall see those who lied against Allah; their faces shall be blackened. Is there not in hell an abode for the proud? YUSUFALI: But Allah will deliver the righteous to their place of salvation: no evil shall touch them, nor shall they grieve. PICKTHAL: And Allah delivereth those who ward off (evil) because of their deserts. Evil toucheth them not, nor do they grieve. SHAKIR: And Allah shall deliver those who guard (against evil) with their achievement; evil shall not touch them, nor shall they grieve. YUSUFALI: Allah is the Creator of all things, and He is the Guardian and Disposer of all affairs. PICKTHAL: Allah is Creator of all things, and He is Guardian over all things. SHAKIR: Allah is the Creator of every thing and He has charge over every thing. YUSUFALI: To Him belong the keys of the heavens and the earth: and those who reject the Signs of Allah,- it is they who will be in loss. PICKTHAL: His are the keys of the heavens and the earth, and they who disbelieve the revelations of Allah - such are they who are the losers. SHAKIR: His are the treasures of the heavens and the earth; and (as for) those who disbelieve in the communications of Allah, these it is that are the losers. YUSUFALI: Say: "Is it some one other than Allah that ye order me to worship, O ye ignorant ones?" PICKTHAL: Say (O Muhammad, to the disbelievers): Do ye bid me serve other than Allah? O ye fools! SHAKIR: Say: What! Do you then bid me serve others than Allah, O ignorant men? YUSUFALI: But it has already been revealed to thee,- as it was to those before thee,- "If thou wert to join (gods with Allah), truly fruitless will be thy work (in life), and thou wilt surely be in the ranks of those who lose (all spiritual good)". PICKTHAL: And verily it hath been revealed unto thee as unto those before thee (saying): If thou ascribe a partner to Allah thy work will fail and thou indeed wilt be among the losers. SHAKIR: And certainly, it has been revealed to you and to those before you: Surely if you associate (with Allah), your work would certainly come to naught and you would certainly be of the losers. YUSUFALI: Nay, but worship Allah, and be of those who give thanks. PICKTHAL: Nay, but Allah must thou serve, and be among the thankful! SHAKIR: Nay! but serve Allah alone and be of the thankful. YUSUFALI: No just estimate have they made of Allah, such as is due to Him: On the Day of Judgment the whole of the earth will be but His handful, and the heavens will be rolled up in His right hand: Glory to Him! High is He above the Partners they attribute to Him! PICKTHAL: And they esteem not Allah as He hath the right to be esteemed, when the whole earth is His handful on the Day of Resurrection, and the heavens are rolled in His right hand. Glorified is He and High Exalted from all that they ascribe as partner (unto Him). SHAKIR: And they have not honored Allah with the honor that is due to Him; and the whole earth shall be in His grip on the day of resurrection and the heavens rolled up in His right hand; glory be to Him, and may He be exalted above what they associate (with Him). YUSUFALI: The Trumpet will (just) be sounded, when all that are in the heavens and on earth will swoon, except such as it will please Allah (to exempt). Then will a second one be sounded, when, behold, they will be standing and looking on! PICKTHAL: And the trumpet is blown, and all who are in the heavens and all who are in the earth swoon away, save him whom Allah willeth. Then it is blown a second time, and behold them standing waiting! SHAKIR: And the trumpet shall be blown, so all those that are in the heavens and all those that are in the earth shall swoon, except such as Allah please; then it shall be blown again, then lo! they shall stand up awaiting. YUSUFALI: And the Earth will shine with the Glory of its Lord: the Record (of Deeds) will be placed (open); the prophets and the witnesses will be brought forward and a just decision pronounced between them; and they will not be wronged (in the least). PICKTHAL: And the earth shineth with the light of her Lord, and the Book is set up, and the prophets and the witnesses are brought, and it is judged between them with truth, and they are not wronged. SHAKIR: And the earth shall beam with the light of its Lord, and the Book shall be laid down, and the prophets and the witnesses shall be brought up, and judgment shall be given between them with justice, and they shall not be dealt with unjustly. YUSUFALI: And to every soul will be paid in full (the fruit) of its Deeds; and (Allah) knoweth best all that they do. PICKTHAL: And each soul is paid in full for what it did. And He is Best Aware of what they do. SHAKIR: And every soul shall be paid back fully what it has done, and He knows best what they do. YUSUFALI: The Unbelievers will be led to Hell in crowd: until, when they arrive, there, its gates will be opened. And its keepers will say, "Did not messengers come to you from among yourselves, rehearsing to you the Signs of your Lord, and warning you of the Meeting of This Day of yours?" The answer will be: "True: but the Decree of Punishment has been proved true against the Unbelievers!" PICKTHAL: And those who disbelieve are driven unto hell in troops till, when they reach it and the gates thereof are opened, and the warders thereof say unto them: Came there not unto you messengers of your own, reciting unto you the revelations of your Lord and warning you of the meeting of this your Day? they say: Yea, verily. But the word of doom of disbelievers is fulfilled. SHAKIR: And those who disbelieve shall be driven to hell in companies; until, when they come to it, its doors shall be opened, and the keepers of it shall say to them: Did not there come to you messengers from among you reciting to you the communications of your Lord and warning you of the meeting of this day of yours? They shall say: Yea! But the sentence of punishment was due against the unbelievers. YUSUFALI: (To them) will be said: "Enter ye the gates of Hell, to dwell therein: and evil is (this) Abode of the Arrogant!" PICKTHAL: It is said (unto them): Enter ye the gates of hell to dwell therein. Thus hapless is the journey's end of the scorners. SHAKIR: It shall be said: Enter the gates of hell to abide therein; so evil is the abode of the proud. YUSUFALI: And those who feared their Lord will be led to the Garden in crowds: until behold, they arrive there; its gates will be opened; and its keepers will say: "Peace be upon you! well have ye done! enter ye here, to dwell therein." SHAKIR: And those who are careful of (their duty to) their Lord shall be conveyed to the garden in companies; until when they come to it, and its doors shall be opened, and the keepers of it shall say to them: Peace be on you, you shall be happy; therefore enter it to abide. YUSUFALI: They will say: "Praise be to Allah, Who has truly fulfilled His Promise to us, and has given us (this) land in heritage: We can dwell in the Garden as we will: how excellent a reward for those who work (righteousness)!" PICKTHAL: They say: Praise be to Allah, Who hath fulfilled His promise unto us and hath made us inherit the land, sojourning in the Garden where we will! So bounteous is the wage of workers. SHAKIR: And they shall say: (All) praise is due to Allah, Who has made good to us His promise, and He has made us inherit the land; we may abide in the garden where we please; so goodly is the reward of the workers. YUSUFALI: And thou wilt see the angels surrounding the Throne (Divine) on all sides, singing Glory and Praise to their Lord. The Decision between them (at Judgment) will be in (perfect) justice, and the cry (on all sides) will be, "Praise be to Allah, the Lord of the Worlds!" PICKTHAL: And thou (O Muhammad) seest the angels thronging round the Throne, hymning the praises of their Lord. And they are judged aright. And it is said: Praise be to Allah, the Lord of the Worlds! SHAKIR: And you shall see the angels going round about the throne glorifying the praise of their Lord; and judgment shall be given between them with justice, and it shall be said: All praise is due to Allah, the Lord of the worlds.